I am home from vacation and need to spend some time writing a really good post to tell you all about it. Needless to say, Vermont was beautiful. It was the perfect vacation to get me in the mood for a new sew along. 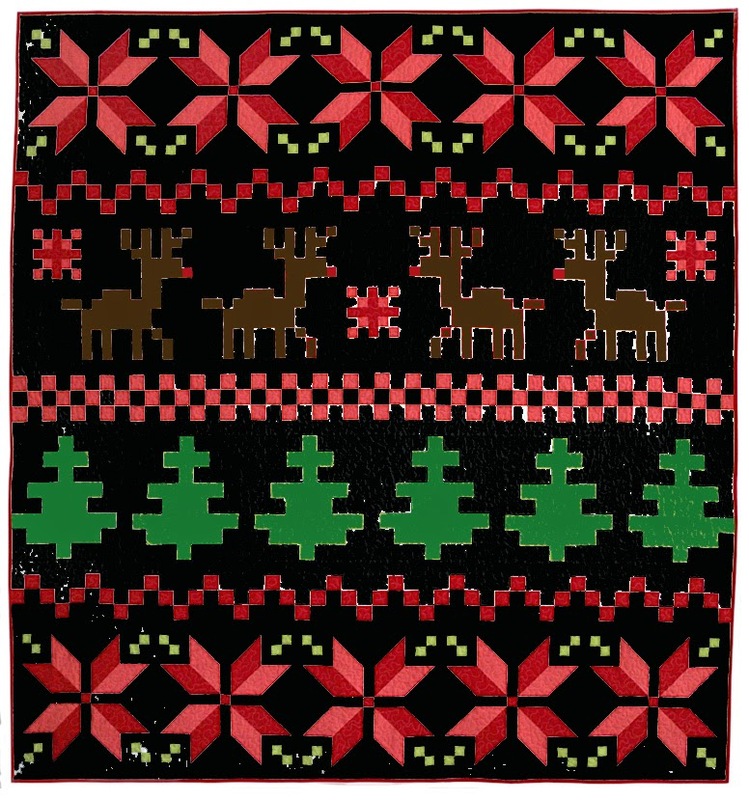 Have you seen the news that Lee of Freshly Pieced is having a Fair Isle Sew Along? From the moment I saw some photos of her poinsettia pillows I was smitten and now she has gone and designed a whole quilt. You can see Lee's original plan in the link above but I decided to load her photo into Photoshop Elements and recolor it to audition other color choices. Here is what I came up with. I think it looks like an Amish style quilt and I am very excited to start this. I thought I'd go a little more traditional and add in brown reindeer. Black for the background, Cranberry and Lipstick for the poinsettias, Cappuccino for the reindeer and Turf for the trees. I just placed my order today so I hope the fabric arrives quickly, otherwise I will be starting a little late. Is anyone else going to play along? This will be a fun, no pressure sew along. I downloaded the pattern but I am going to be late starting. Your idea is fabulous! Di, am I missing what color you are using for the poinsetta leaves? I was tempted, it's a lovely pattern. But I'm not starting anything else new now!